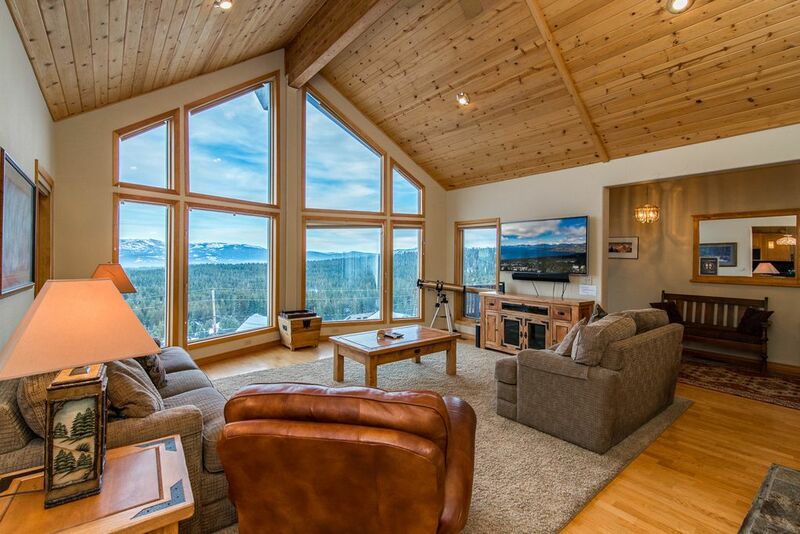 This 4BR/2BA vacation rental in Truckee offers all the charm of a classic ski cabin and the luxury of a modern chalet. The mountains are where it all begins – and you’ll get a good glimpse them from a private deck overlooking a landscape that beckons you to explore. With two separate living areas, there’s plenty of space to spread out and relax or enjoy indoor table games. Upstairs, gaze at mountain peaks from a leather armchair or watch your favorite movies on a large screen TV with surround sound. Downstairs is the spot for lively foosball or ping pong games, with lots of room for spectators on the three large couches. Mealtime is a cinch in a gourmet-inspired kitchen with designer wood cabinets and modern appliances. Serve up family feasts at a large rustic table that seats 8, or have smaller intimate meals at a cozy breakfast nook surrounded by mountain views. Each of the four bedrooms exudes quintessential cabin-style charm with natural log bed frames and comfy alpine comforters. The master bedroom offers a king-sized bed, en-suite bath with a jetted tub and access to an expansive deck with panoramic views. The second bedroom offers a queen-sized bed, while the third offers an XL twin-over-queen bunk. Kids will love the fourth bedroom with two twin-over-twin bunk beds. This pet-friendly property has parking for up to 4 vehicles. Please note the driveway is rather steep and will require 4WD/AWD vehicles during the winter months. Your rental provides access to Tahoe Donner’s unprecedented collection of recreational amenities. Get active together and take advantage of a truly dizzying array of things to do. Visit the Trout Creek Recreation Center, with fitness rooms and classes, lap pool, spas and steam, massages, and more (nominal daily entry fee required). Or visit the Tahoe Donner Tennis Center, catering to both pros and newcomers. The Beach Club Marina offers unbound lake views, watersports rentals, and a great beach for sun and sandcastles. Try Tahoe Donner Cross Country & Downhill Ski Areas, one of America’s premier cross-country facilities with 100km of trails through rugged scenery…and a family-friendly ski area with top-notch instruction. Enjoy snowplay, laidback après-ski with sledding, tubing, fire pits and, of course, hot chocolate. In summer, bring clubs for the Tahoe Donner Golf Course, and hiking shoes for traversing 60 miles of trails—or explore them on horseback from the Tahoe Donner Equestrian Center! Families love Pizza on the Hill for its kid-friendly fare, game room, and reasonable prices (in the Northwoods Clubhouse). Check out The Lodge Restaurant and Pub for casual and delicious fare on the golf greens. Or head to the Equestrian Center for its famous Saturday Night BBQ. House is large, with great layout and beautiful views. Looks just like in the pictures. Kitchen is a little outdated but everything works well. Great for families with a nice downstairs area with 4 beds (2 bunk beds), ping pong, and foosball. Nice spacious master bedroom with comfortable bed and large bathroom. The main issue was the driveway. There was a lot of snow, so you really need a truck to go up the driveway. We had two Highlanders with AWD and neither car could get up. It is a very long driveway but we had to park at the bottom of it and then walk up all of the luggage / groceries at night after a long day of driving and skiing. We managed to drive up the next day, but later in the week one of the cars got stuck in the driveway and we had to call car insurance to help us dig it out. Ultimately if there is snow there, it is risky to go up the driveway unless you have a truck. The other issue is that the lock to get into the house doesn't work consistently, so we couldn't get in the first day for a few hours until someone from TurnKey came to the house with a spare key. This and the driveway made for a very difficult first day. I assume they will fix the lock so it will not be a problem in the future, but the driveway issue needs to be stated more clearly in the description of the house. The home has a great layout for a family that wants to relax together and, yet, still have peace and quiet. We had all of the amenities that we needed plus the views are incredible! We had an amazing time! The house had everything we needed and the view was amazing! The only thing was that the house was really warm during the day and it barely cooled down at night even with some of the windows open. The house only had a heater central unit (not sure if that’s the correct term) but no AC. I know that this place is usually rented during snow season, but it would be nice to have an AC unit for guests who come during summer. Other than that I would recommend this place to people, it’s a perfect getaway spot for anyone who wants to take a break from city life. We made a very last minute summer trip to Tahoe, and chose this home in part because of the ping pong and foosball tables. We have three boys, and half of the fun is playing with Dad on vacation. We were surprised how large the home actually was! It is huge. It is a beautiful home that is well maintained. The property was clean. We were only there for a short stay, so we ate out and really only made coffee in the kitchen. The information on the driveway was very accurate. I would definitely recommend this home to a large group. This is a great home for multiple families. And, for us, it was wonderful to use the passes and enjoy Donner Lake and the Trout Creek Recreation area. Fabulous, spacious, well lit, comfortable chalet. We loved this gorgeous chalet. Really comfortable and the kitchen is well appointed with anything you could ever need. Beds were really comfortable and we all (a family of 6) slept really well. I can’t recommend this more, and I haven’t even mentioned the view which is breathtaking. Don’t hesitate to book this lovely home!